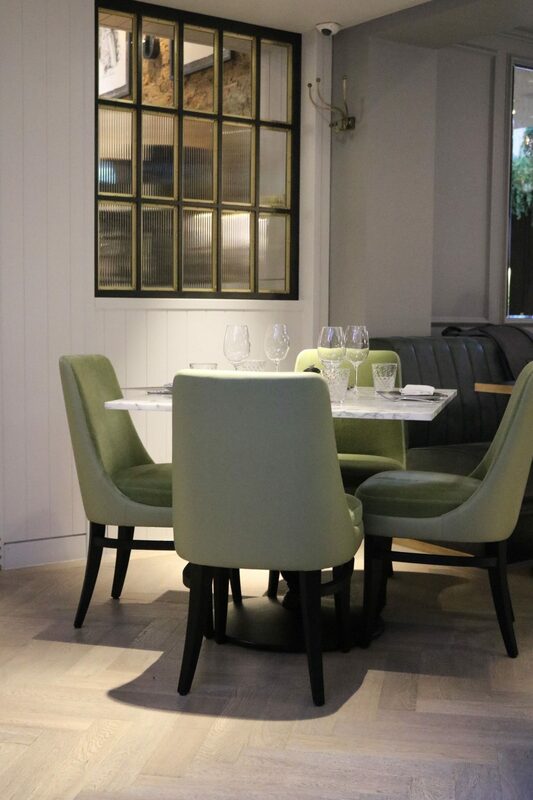 Hans’ Bar and Grill is a lovely brasserie close to Sloane Square underground station and although part of the newly refurbished boutique hotel No 11 Cadogan gardens, this brasserie is a stand alone restaurant located on a lovely quiet street full of artisan shops with its own entrance. It is also part of the same group as Chewton Glen, where I have had lunch at The Kitchen, and Cliveden House. The interiors are fabulous with lots of foliage and natural light, as well as lovely decor and furniture in a tasteful modern design. The restaurant is spacious and as we were seated, I loved the casual yet elegant vibes, and the staff were so welcoming. The cuisine here can be described as modern British, with seasonal ingredients being the focus, and the menu created by Head Chef Adam England, who has taken inspiration from his experience working in kitchens across the country. The wine list is really impressive and the sommelier was really knowledgeable but as it was such a hot day, we both opted to try their signature cocktails instead. Amit went for the British Mule, on the sommelier’s recommendation, whilst I opted for their version of Sangria made with white wine and apricots, apple and peach. They were both the perfect summer cocktails to accompany our meal. To start, we shared the Potato & rosemary bread with whipped butter and the Hand-picked Brixham crab with apple and Cornish leaves. Both were such lovely light desserts and the crab was so fresh. For mains there are so many choices as the à la carte menu is extensive, with varied choices to suit everyone’s requirements. I was reading them all thinking I wanted to try everything but I am also highly predictable (according to my husband) and so I chose the Ricotta and truffle gnocchi with spinach and parmesan. I love truffle and this dish was such a treat to the senses and beautifully cooked. It was a comfort dish and one I would definitely order again. It was also a generous portion size and I was really full after! Amit opted for the Loomswood Farm duck breast with blood orange, Romanesco and kohlrabi, which he devoured. He said it was perfectly cooked and the flavour combinations were complimentary and really refreshing. He had really been intrigued about how they would all work together and he felt that they married really well. The restaurant is named after Hans Sloane, who first brought chocolate to London and so it was an absolute no brainer that we were going to pick the chocolate options for dessert! In fact I always peer at menus well in advance of eating somewhere and always have my dessert choice mentally picked out! The salted caramel chocolate pot was my choice on this occasion and was a really decadent pot served with a scoop of vanilla ice cream. It was so delicious I wish I could have it now as I type this up. It is a must order! As a dark chocolate lover, Amit had the Sloane’s dark chocolate fondant served with a refreshing cherry sorbet and judging by the silence as he tucked in, I can tell that it was sublime. He didn’t even share! We both had a really lovely meal and I highly recommend it for its ambience, delicious food, attentive service and the restaurant is so light, airy and spacious, that it is the perfect place to enjoy drinks and food in these long summer days that we are blessed with! To find out more visit their website here. My meal was complimentary but all views and photos are my own. I would definitely order the ricotta and truffle gnocchi, I’m a sucker for anything with truffle! And both those desserts sounds divine! Basically Binny, you had me at teh mention of the word truffle! Sheer elegance and sophistication! I love a white sangria, but it’s often quite hard to find on a menu. That one sounds yummy!